Merle Wood & Associates is pleased to offer the LADY MICHELLE yacht for sale. With accommodations for 13 guests in 6 staterooms, she features 1 king VIP on the bridge deck, as well as 2 queen staterooms and 2 twin staterooms on the lower deck. All are equally stunning, and feature their own en suite and entertainment system. Her full-beam, split-level, main-deck master suite features a raised observation lounge forward and steps down to the sleeping area with a king-size bed. The his-and-hers en suite features an oversized marble-clad Jacuzzi, and is enveloped in rich, dark wood. It’s an honor to have the LADY MICHELLE yacht for sale, especially considering Merle Wood & Associates sold it directly to her current owner, while also representing her previous owner when we had the yacht listed for sale as CAKEWALK. We are extremely grateful for the loyalty and trust of our clientele, and we work tirelessly to deliver the results our clients have come to expect from us. We are offering the LADY MICHELLE yacht for sale with an interior and exterior design by Stefano Natucci, who created spaces with tasteful, contemporary styling, neutral tones and gentle pops of color. Her main salon is surrounded by large windows and peppered with comfortable soft furnishings, while the skylounge is equally plush, and has grouped seating as well as a bar. We are representing the LADY MICHELLE yacht for sale, which features expansive exterior decks intended for socializing, entertaining and relaxing. The main deck aft features a large built-in U-shaped sofa facing 2 small cocktail tables and cushioned wooden armchairs. The upper deck aft boasts a large dining table on which to enjoy al fresco dishes, and an oversized built-in sofa aft that extends full beam. Her sun deck features a forward Jacuzzi and sunpads, as well as a casual dining area shaded by the overhead arch. A bar here adds convenience for guests. Twin Caterpillar engines offer a top speed of 16 knots, a cruising speed 14 knots, and a 6,000nm range at 11 knots. She is also equipped with zero-speed stabilizers for the ultimate in comfort. As a highly respected and successful luxury yacht broker, Kevin Greene has been entrenched in the yachting industry for over 20 years, and has traveled the globe for the purchase, sale, construction, and charter of the most prestigious yachts worldwide. For additional information, read the full LADY MICHELLE yacht specs or view the LADY MICHELLE yacht price and details. 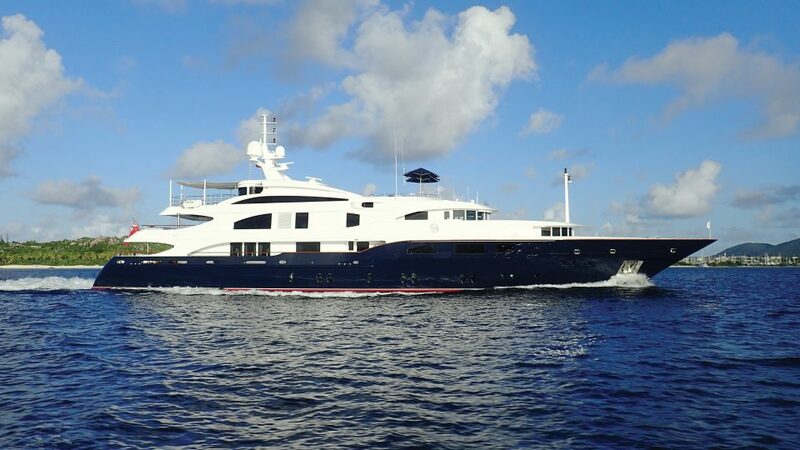 For information about the LADY MICHELLE yacht for sale, or for expert knowledge from a qualified yacht broker, simply contact the luxury yacht brokerage firm of Merle Wood & Associates for assistance.